Borderlands 2 just came out, so I expect the next few months will feature lots, lots, lots of late night looting and shooting with my friend Ash. First thoughts: it’s very Borderlandsy. It’s full of guns, clever writing, a plethora of objects to loot and grotesque aliens and humans to kill, and only just enough plot to get you moving. The next thing to notice is that Gearbox evidently had more time and money, so they’ve polished the game to a much brighter sheen. Levels are prettier, there’s more voice acting, the characters have different heads available, the UI is revamped, and there are lots of little details that are better done. There are ladders now. There are maps of the entire continent that the levels fit into. There are more animations, such as a fancy new respawn animation. 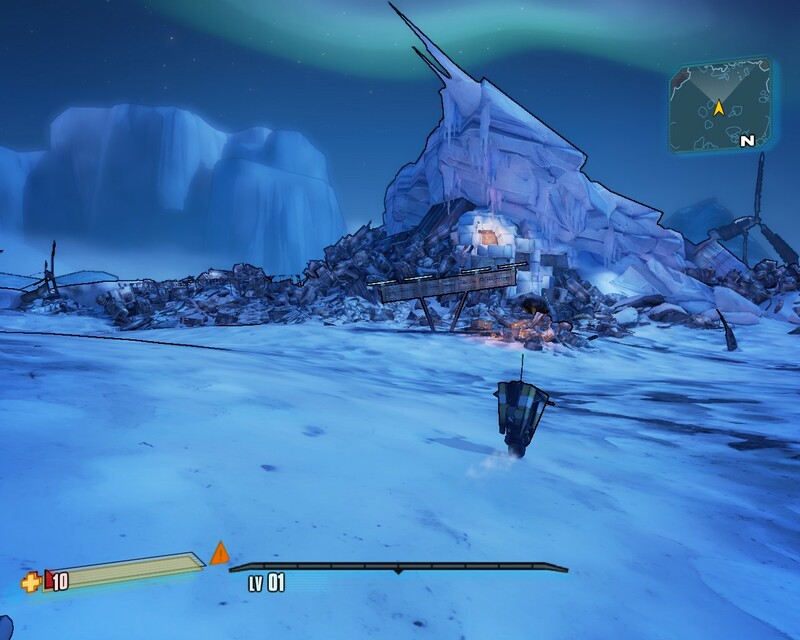 Most strange, for Borderlands, is that there’s actual exposition now. BL1 contented itself with text in the quest descriptions, and that was easy to miss, especially if you were helping someone else with their quests. It’s almost odd to stand around listening to Lilith and Roland talk (especially as one thing they didn’t do was create good animations for talking characters). An unusual design choice: there’s an all-new slate of Vault Hunters; the player characters from the first game reappear as NPCs, the leader of the resistance to the evil Handsome Jack, the antagonist. It’s fun to see them again, but it’s also a bit jarring, because we were them. If you’re playing Batman, say, it’s not a problem if the Bat has been having other adventures since the first game. But in a roleplaying game you’re encouraged to think your character is you, so it’s a little strange that they suddenly have characters and personalities of their own. One minor change I’m not sure I approve of: the game now treats you as a hero. A Vault Hunter is something special, and you’re told that only you can defeat Handsome Jack. That’s standard adventure game fare, but BL1 was blessedly free of it. I admired the way the first game found a perfect match between player and character goals. You wanted to shoot things and get loot, and that’s precisely what your character wanted too. You were just a random adventurerer, in the right spot at the right time. OK, it’s way late here, because I’ve been playing Borderlands 2 for hours. If you liked BL1, it’s basically the same stuff, only more of it. And like BL1, it’s at its best in co-op mode. Ash and I have spent an embarrassing number of hours wandering Pandora. Because that next chest might contain the world’s most awesome gun. And we’re pretty good about not yoinking stuff before the other guy’s seen it.